In 1999 Joseph Pine and James Gilmore offered readers the idea of the experience economy as a new way to connect with customers and secure their loyalty. As a result, their book The Experience Economy is now a classic, embraced by listeners and companies worldwide and available in more than a dozen languages. Though the world has changed in many ways since then, the way to a customer’s heart has not. Linchpins are the essential building blocks of great organizations. Like the small piece of hardware that keeps a wheel from falling off its axle, they may not be famous but they’re indispensable. And in today’s world, they get the best jobs and the most freedom. Have you ever found a shortcut that others missed? Seen a new way to resolve a conflict? Made a connection with someone others couldn’t reach? Even once? Then you have what it takes to become indispensable, by overcoming the resistance that holds people back. For those reviewers who found this book unsatisfying, I suspect they missed the point. 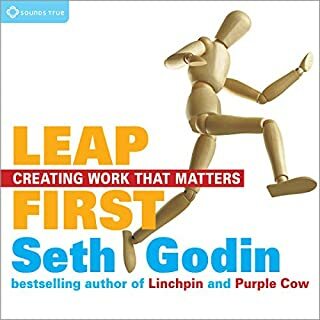 This is easily Seth Godin's most important and insightful book since "Purple Cow". The point is, you are unique and capable of so much more than you have been sold to believe; you are ro can be a "Linchpin". 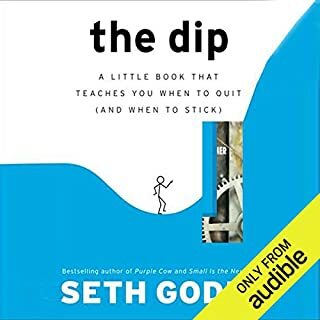 This book/audiobook helped me make it through the most difficult year of my professional life. Saying that this book is "Inspiring" doesn't do it justice. Listen to it, accept the reality that Seth shares, and take control of your life. 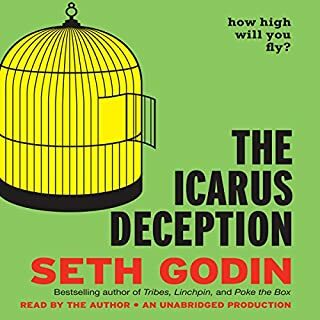 Also, if you're familuar with Seth's previous audiobooks, this is easily his best performance. I love them all, but his audiobook performance has come a long way from "Purple Cow". Are You Also a Godin Fan? It seems whatever Godin is selling I'm buying. Gotta give him credit for that. My advice for Linchpin is to make it through the first half of the book - as the second half is really where the action is. Stick it out. Godin might have something to sell, but that does not mean he is wrong. His basic point that, that the economy has ripped away any security of careers or institutions, and that we need to change our outlook towards work, is probably exactly right. The question is what do we do with this knowledge. I like Godin allright, some folks may hate him, I think he is worth reading to generate a great discussion. Lots of good information, though some of it, like the concept of resistance, are "borrowed" from other authors. Most notably Steven Pressfield. The first part of the book is a little tough to get through, but he brings it all together in the second half. Well worth the listen. This book is great. 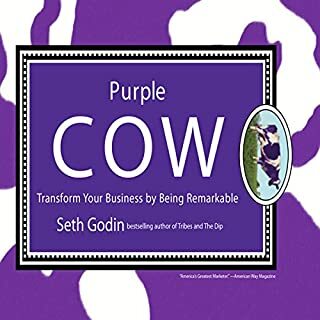 You don't need this book to tell you "how to" be indispensable, but it will come naturally once Seth Godin has INSPIRED you to be indispensable! It's about how to approach and execute your "job" functions so the net result of your performance day to day expresses who you are and what you can be. You are unique and indispensable, and deserve to experience and enjoy all of the gifts that you can give and receive through your life's work. I am encouraged, inspired and optimistic and have been recommending this book to everyone. Plus it is read by the author, who miraculously does not have an annoying voice. This book is fantastic at outlining WHAT needs to be done in order to be a Linchpin. However, it does not tell you HOW. That is why there are some reviewers who will not like this book. Seth even addresses this type of thinking in this book by stating the fact that a map for implementation/leadership does not exist because if it did, then anyone could do it and it would cease to be a true work of art. A Linchpin is able to see WHAT needs to be done and makes their own map as to HOW to get it done and shipped. If you want a step-by-step book of what it takes to be incredible, this is not your book and I would be highly suspect of any book that claims that it can contain a template for original creative greatness. 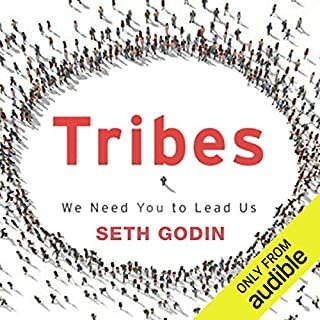 I enjoyed listening to Seth Godin read his book--meaning, I liked his voice and reading style--but honestly, it felt like he was reading unconnected blog entries in no particular order. Sometimes it seemed as though the title of the "chapter" was as long as the "chapter." This is a made-up example, but a lot of the book sounds like this: Title: To be a Lynchpin is to be Indispensable. Body: If you are an Artist, and do only what you can do, then you are indispensable. You are a Lynchpin. Despite this, I patiently waded through the 4.5 hrs. of what I determined to be "Malcolm Gladwell lite" hoping for some sort of payoff. A call to action, a step-by-step plan--even a decent recap of what I'd just spent 3 weeks trying to get through. Anything! I won't be a spolier, but let's just say that I was laughing so hard at the way the book ends (because I felt like such a sucker) that I almost drove my car off the road. If you went to the bookstore and bought a bunch of books with motivational phrases, took those books home, cut out each phrase and put them in a pillowcase, and then shook that pillowcase, and then pieced each phrase back together at random, you would have something more coherent than this book. It's like when you are awake at 3AM and there's nothing on TV except infomercials. The idea of being a linchpin is a worthy idea and well worth pursuing. The problem is that this book doesnt even try to understand what exactly a linchpin is. At best, everything is anecdotal, strung together with feel-good hollow statements like 'resist the demon'. I think that was from Rocky III. I was expecting something a bit more scientific, maybe a personality exploration of the linchpin in his or her native habitat. Nope. How about a story detailing how a regular Joe goes from regular to linchpin? Nada. This book will underwhelm you. 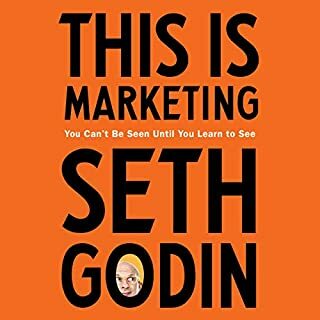 I was looking forward to this book after hearing an interview with Seth Godin, but there is very little in the 4 1/2 hours that isn't self evident to any reasonably educated professional. The book may be valuable at the high school or early college level in exposing students to ways of thinking about a career/profession. This book of creative discovery blow me off my chair. The "machine" that has held a generation in fear from expressing the artist on the inside is dying. Seth Godin uncovers the truth about the suppressive nature of the economic machine. Inside of each of use lies an artist that was made to create and be creative. This audible will propel you past the mediocre, and into a new level of creativity. My fav above all. Almost nothing more to add. I've been recommending this book many times since I attended Seth Godin's conference in Laguna Beach about 2 years from now. I read it a couples times and finally even bought the audio version, no need to say how I stick into it. Of course, I definitively give 5/5 as overall score. If I really had to find a negative point, the only thing I could say is that Seth Godin miss a bit in linking all the dots into a story. If in one way or another, he could develop the big picture like he tells a story, I think he could have even larger audience. I like the narrator and there are some good elements of this story. However it is let down by shoddy examples and surprising citations. He claims that cancer can be reversed by the placebo effect and harps on about the cringeworthy genius of everyone, while at the same time being completely derogatory towards many professions. I found this to be populist and ill thought out. I’m sure it sold a lot! Instead of this book, try something useful and well research like “how to have a good day” by Caroline Webb. Note that I like Seth, but I think it could have been so much better. How to be an artist. This book it will remind you the artist you are and it will make you feel it that is necessary to pursue this art because average people any organisation can replace but an Artist is not that easy. The same information could have been imparted, with greater effect, on fewer pages. Rather repetitive. This book feels quite disjointed and repetitive and I really struggled to get through it. Some novel observations. I feel it was saying the same thing over and over again. A small blog could have been enough. There was not enough material to make it a book, just repeating the same argument in different ways is not enough. Seth was able to gather plenty of thoughts that we seem to have every now and then, things we probably already know, see and feel but forget to consume, parse and spit out in the form of the valuable outcome - both for the world and for ourselves. I was disturbed for years by soulless, corporate and stiffy strategies, so-called customer care, cog-focused recruitment practices and so on. I fought this fight as linchpin, not knowing how to call myself, how to describe my value and „superpower”. Though I was lucky to work with people who recognised a lot of it, I realised it is me that creates it, gives it to them, and the good things come back without me taking any effort to „take”. Thank you, Seth. I will definitely listen this one again at least once and most likely buy hard copy to be able to highlight sections that I value the most and want to remind myself from time to time. This book is for everyone who at least feels a spark of being different, wanting to do something extraordinary, wanting to give and live with sense of fulfilment of doing something they really like. Not for cogs (no offence) - if you’re happy to sit „safe”, repeat, avoid risks... not for you. You are needed in the form you are, too. Commodity is part of the better world too, but just on a smaller scale. vital and valuable advice, a must read for anyone wanting to improve and learn ! Seth gives so much value in this book. I love that he reads it too. If you want to get fired up to do your best work and feel that the best is yet to come - I encourage you to take the time listen, to exactly why your feelings are correct! Many business books focus on scaling - it's refreshing to hear one that focuses on art. 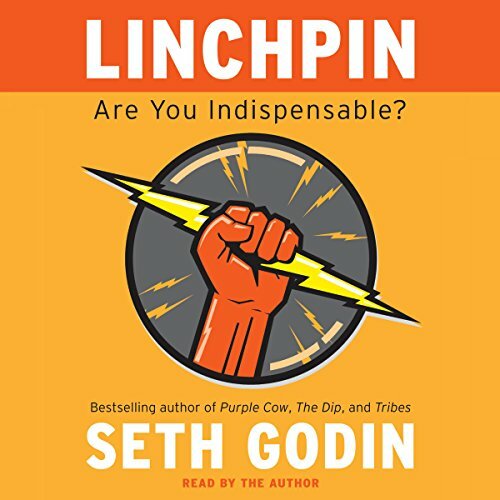 What made the experience of listening to Linchpin the most enjoyable? This is the kind of book that needs to be read more than once, I will be buying the paperback version because I loved this audiobook so much, I want to keep it forever on my shelf. As someone who has always been the odd one out, and the quirky ideas man in a business, I loved the concept behind this book. Great philosophy and approach to standing out and being great at what you do. And once again a brilliant piece by Seth, in his own words and voice!